from anywhere.Keeping this in mind, School Management Software has been developed in a manner making it fully compatible with Android and IOS technologies. Our school mobile applications are a source of instant information for convenience of the Management, Principal, Parents & Teachers. With special features like singlesign in for multiple users the task of accessing all the information regarding the student’s development & progress by keeping everyone connected has become all the more efficient. The Online School Management Software offers an online payment system through School ERP Mobile Apps which has emerged as an effective feature for the payment of fees. In this busy schedule of life, parents do not have time to pay the fees by going to a school but, the Web Based ERP offers this feature of hassle free fee payment & real time generation of fee receipts, due receipts, tuition fee certificates at any time which also benefits parents & school administration to stay updated of all the records of the students. Unlike the typical attendance marking by using the registers, CampusCare School Administration Software extends the feature of attendance marking by using an ERP App for Schools easily & quickly. In addition to this, automatic alert information is also sent to parents regarding the attendance status of their child via SMS alerts. Hence, parents can always keep themselves updated of their child’s presence inside the school premises. In this busy span of life, the working parents do not have an option of keeping a check of child's notebooks regarding the assignments & daily home work. The System ERP Mobile Apps provides an efficient feature where teachers can upload the daily assignments thus, enabling a parent keeping a strict vigil by just logging in to their individual parent portals. All the relevant information regarding examination including syllabus, time table, date sheets, etc. can be uploaded in the individual parent portals which will eventually benefit parents to keep themselves updated of their child’s academic activities by logging in to their portals through ERP Mobile Apps. In addition to it, report card verification can also be done while parents are on the go without even going to school and by just a single click through the School ERP Software Apps. 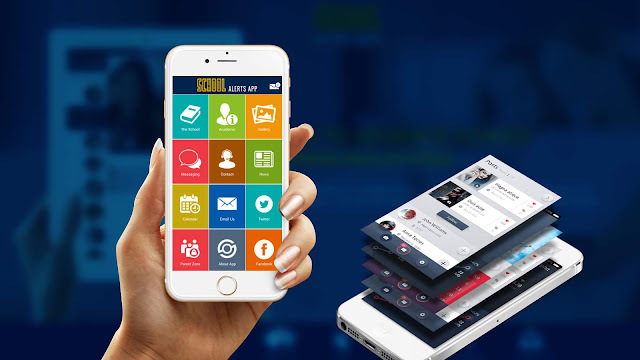 The School Management Mobile Apps also offers an incredible feature of employee salary generation and also helps the staff to have a detailed go through over their salary details by just logging in to their staff portals. The employee leave status & records can also be maintained by using this Software App so as to keep themselves up-to date of all their work related details. The School ERP Software Apps also helps parents to be always notified of any activity or events, news, circulars via SMS regarding their child’s welfare as well as academic development. Therefore, it helps in a way where parents can boost up the talents of their child and also support the child’s growth & progress in academics as well as the extra-curricular activities. Hence, Inventive IT Services School Management Software is customizable, reliable, effective, compatible, scalable. It also improves the teaching quality which brings out a strong association between parents and teachers which is a high beneficial factor in the student growth. Inventive IT Services is one of the Leading Brand in Student Information System for Schools where information regarding every student is maintained in a systematic way and can be retrieved within no time. Unlike the earlier education system where data was recorded in books, Inventive IT Services which is the Pioneer in School Management Software ensures of maintaining the complete school administration data in a Single ERP System.